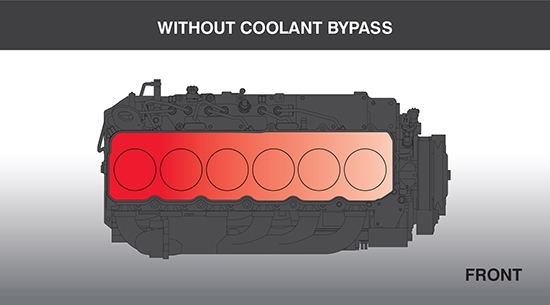 The rear cylinders on the 5.9/6.7L Cummins suffer from a lack of coolant flow, and therefore, experience the highest coolant temperatures. This can cause excessive pressure to build in the cooling system, especially the rear of the block and blow out freeze plugs externally, or the smaller diameter plugs under the valve cover, leading to a failure. Our coolant bypass kit adds a secondary thermostat, that unlike other brands, works based on temperature instead of excessive pressure. This solves the problem before pressure becomes an issue by ensuring consistent temperatures across all six cylinders. Why do I need a Fleece Coolant Bypass? One of the biggest issues on the 5.9/6.7L Cummins is the coolant flow problem to the rear cylinders. This can cause catastrophic failure or blow outs of the freeze plugs in an over-temperature / over-pressure condition. 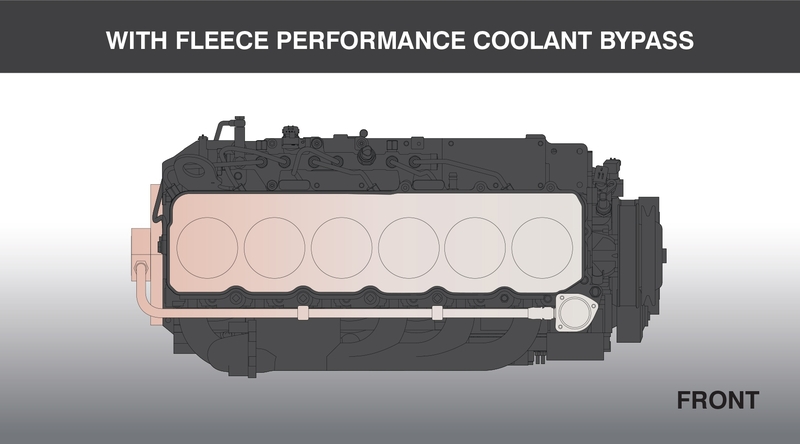 The Fleece Coolant Bypass is one of the most important additions you make to improve the reliability and longevity of the Cummins platform. The 2003 - 2007 5.9L automatic transmission version will eliminate the factory transmission fluid heat exchanger. The heat exchanger is designed for use in cold climates to warm the transmission fluid with the engine coolant. It is not necessary for use in warm climates or high horsepower applications, nor does it detrimentally affect the trucks performance when removed. For model years 2007 - 2018 6.7L trucks, including both automatic and manual equipped transmissions, factory installed transmission fluid heat exchangers are uncommon. For customers with a 6.7L that has a heat exchanger, a heater tube can be purchased at your local Chrysler Dealership [PN:68048997AA] to complete the installation.